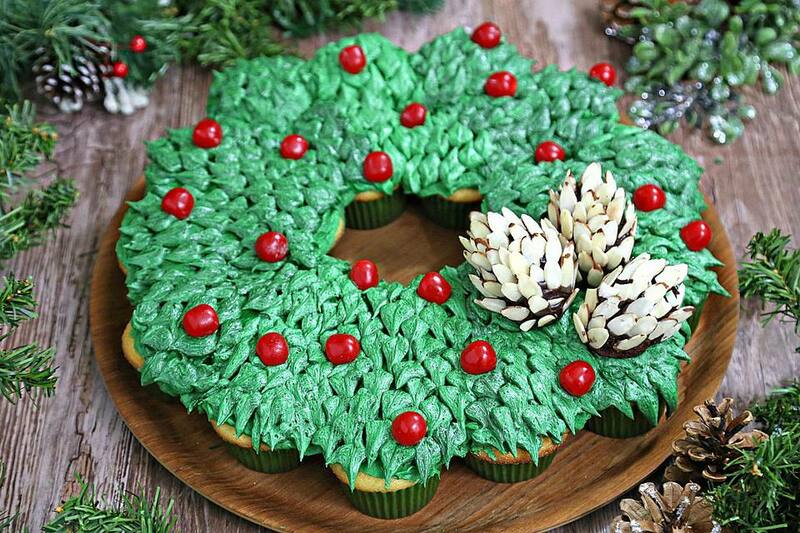 This Cupcake Wreath is a Christmas showstopper! It's easy to make, and entirely edible, from the frosting leaves to the candy berries to the super-cute pinecones on top! The best part is, this dessert can double as a centerpiece, and it also feeds a crowd. To simplify things, you can use store-bought cupcakes, but if you have time, make your own. Note: this recipe calls for a lot of buttercream! To cover the cracks between the cupcakes and pipe all the leaves, you'll need about 8 cups of buttercream. If you want to use less, you can skip the step where you cover the cupcakes with a thin layer of buttercream before piping—just be aware that some bits of cupcake might show through the leaves on the wreath. Note: while there are multiple steps to this recipe, this cupcake wreath is broken down into workable categories to help you better plan for preparation and cooking. Place the powdered sugar, butter, milk, vanilla extract, and salt in the bowl of a large stand mixer fitted with a paddle attachment. Mix on low speed until the sugar is moistened. Scrape down the sides of the bowl, then beat again on medium speed until light and fluffy, about 2 to 3 minutes. Remove 1/2 cup of the frosting to a small bowl and stir in the melted and cooled unsweetened chocolate. To the remaining frosting in the mixing bowl, add as much green food coloring as desired to get a nice, leafy green color. Remove the paper wrappers from 4 of the cupcakes. Crumble the cupcakes in a medium bowl, working them between your fingers until they are nothing but crumbs. Add a few spoonfuls of chocolate frosting and stir, until the crumbs and frosting are well-mixed and they have a Play-Doh like consistency. If needed, add more frosting to get the crumbs to stick together and to get the right consistency. Divide the cake mixture into thirds and form each piece into a teardrop shape about 2 1/2 to 3-inches long. Place on a baking sheet covered with waxed paper. Melt the chocolate chips in a small bowl in the microwave. Dip the end of a slivered in the melted chocolate and press it against the back of one of the cake pinecones. Dip a second sliced almond, then place it next to the first one, overlapping it slightly. Continue to add sliced almonds in an overlapping pattern, working back to front, until your pine cone is covered with almonds. For the most realistic look, use only whole pieces of almond, and try to tilt them forward (instead of having them stick straight up and down). Once all of the pine cones are decorated, refrigerate the tray to set them briefly, for about 15 minutes. Arrange 13 cupcakes in a circle on a large serving plate, and add a ring of 7 cupcakes inside. Spread a thin layer of green buttercream over the tops of the cupcakes. You’re not really trying to frost them, you’re just helping them stick together in the wreath shape and covering up the tops of the cupcakes so the color won’t show through in the final wreath. Fit a piping bag with a large leaf tip (such as the Wilton #366), and fill the bag with green buttercream. Pipe thick leaves on top of the wreath, starting in the center and working your way to the outer edge. Fill up the piping bag as necessary, and continue piping until the whole top is covered with leaves. Carefully transfer the 3 pine cones to the top of the wreath using a spatula. Dot the top with red candies, gumballs, or maraschino cherries.